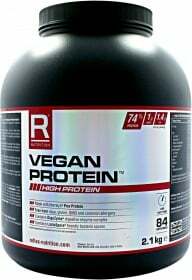 Reflex Vegan Protein provides the best source of protein for those who follow a vegan lifestyle. Vegan Protein has a uniquely balanced formula to help evolve your athletic performance, even if you're not vegan/vegetarian. Its ecological formula is made with Green Energy and consists of extracting pure European pea protein, grown without the use of any chemical products. It's easy to digest and produces results just as effective as animal protein. Vegan Protein contains BCAAs, arginine and glutamine, the best sources of protein for muscle development. Vegan Protein even contains digestive enzymes and probiotics to help digest protein and regulate bowel movements. Vegan Protein is soy-free, gluten-free, gmo-free, and contains no artificial sweeteners or food colorings. If you're vegetarian or vegan, this is the best option for you, without a doubt. There's never been such a high quality organic protein source as Vegan Protein from Reflex. Have a question about Vegan Protein? What is it, what does it do, how and when to use or something else? Ask us. Mix 25g (approximately two level 25mL measures) with 300mL water in a shaker or blender. Consume 2-3 times daily. You may of course take larger or smaller servings but adjust the water accordingly and according to your desired consistency. WARNINGS Vegan Protein : Consult a health care practitioner before starting any diet or exercise program. Store in a cool, dry place. Keep out of reach of children. These statements have not been evaluated by the FDA. This product is not intended to diagnose, treat, cure, or prevent any disease.